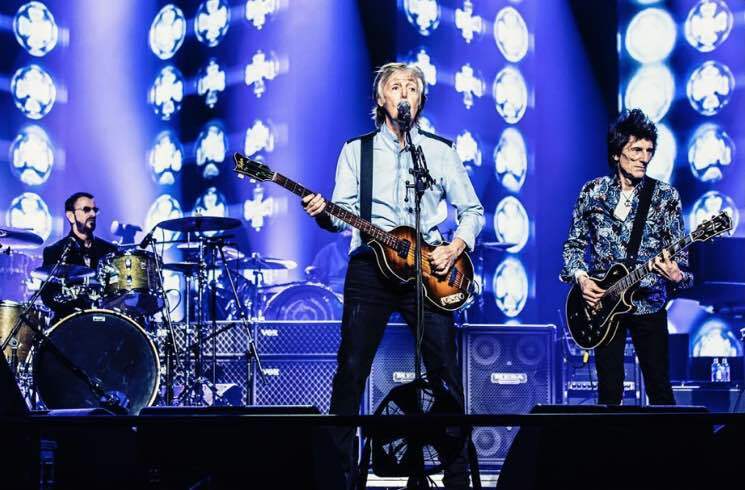 Paul McCartney is in the midst of his "Freshen Up Tour," supporting his latest LP Egypt Station, but the former Beatle dug deep into his back catalogue and brought out some special guests at his show in London last night (December 16). His fellow Beatle Ringo Starr and Rolling Stones guitarist Ronnie Wood joined him for "Get Back." The show took place at London's 02 Arena, and the unexpected musical additions were brought out during the encore. Starr was spotted in the crowd during the show, prompting rumours about an onstage cameo, though the actual performance still came as a shock to many in attendance. Starr and Wood weren't the only famous faces in the crowd, either. The Who's Roger Daltrey was spotted in attendance, and McCartney's fashion designer daughter Stella McCartney later shared a backstage photo of herself with Wood, Starr, her dad and British actress Emma Thompson. Watch footage from the star-studded performance of "Get Back" below.